At the June 7 press conference announcing his decision, Watada argued that the Administration's invasion and occupation of Iraq was "manifestly illegal" because it "violates our democratic system of checks and balances. It usurps international treaties and conventions that by virtue of the Constitution become American law." Watada also said, "As the order to take part in an illegal act is ultimately unlawful as well, I must as an officer of honor and integrity refuse that order." His refusal to deploy was an act of courage. It was also the product of profound reflection on taking personal responsibility for halting the US government's careening course toward authoritarianism and criminality--and of the legal justification for such acts of responsibility. Or, see this article, with a video statement from Watada. Or a site with a lot more suporting material. Watada's most crucial legal claims were corroborated June 29 by the US Supreme Court, in what Duke University law professor Walter Dellinger calls "the most important decision on presidential power ever." In Hamdan v. Rumsfeld, the Court rebuked the Bush Administration not only for the Guantánamo tribunals but also for the entire view of executive power the Administration used to justify them. In a 5-to-3 decision, the Court ruled that the President cannot act contrary to "limitations that Congress has, in proper exercise of its own war powers, placed on his powers." That's just what Watada said about Bush's policy two weeks before: "It violates the Constitution and the War Powers Act that limits the President in his role as Commander in Chief from using the armed forces in any way he sees fit." But the Supreme Court doesn't have its own police force. So, like in other cases where it is the government that is the criminal, it will be the concerted actions of the public that is likely to determine the outcome. Thanks, Ming, have linked to it and to you in my July 29 post. I didn't know about Watada. News such as this never makes the headlines even though it's far more important than so much that gets acres of media attention. Like, for example, the recent protest demonstration in Israel by some Israelis who do not support their govt's actions in Lebanon. On July 5 the US Army brought charges against First Lieut. 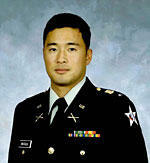 Ehren Watada, an infantry officer (Watada is an Artillery officer and not Infantry) stationed at Fort Lewis, Washington, who has refused to deploy to Iraq with his unit because he believes the war there is illegal. Watada faces up to eight years (seven years maximum penalty if convicted on ALL charges) in jail and a dishonorable discharge. But in trying the 28-year-old officer, the Army is really putting itself, the Iraq War and the Bush Administration on trial.